Born into a falling home, Isaac Newton grew up without a father and lost his mother to a different man at the age of two. Newton grew up with his grandmother and confessed that he had hated his mother ad stepfather to the point that he thought of burning them alive! But, from the anger and hatred of this young man eventually, with God’s caring hand, turned into one of the most acknowledged scientists in the world! Newton is mainly known for his research and discovery of gravity so many years ago but what few realize about him is that he believed and read his Bible and also studied, wrote and published works on the Bible! Although it is a fact few people acknowledge, especially those of whom it works against. Is isn’t that the Creator tells us of the creation but the creation tells us of the Creator! Isaac Newton knew that. 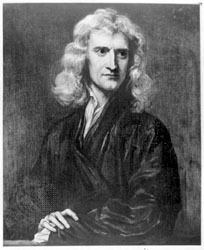 Although Newton is widely depicted as sitting under an apple tree, contemplating hard on some problem or theory when all of a sudden an apple falls on his head and he suddenly begins thinking about the force that brings an apple down from a tree, this story is most likely false. Some say it was a just a creative story to add some color into the true history. Whether or not the traditional story is true doesn’t matter, as long as we remember what this man believed and said!